Our Sulfur Salt Lick in the form of a compressed sulfur salt block is made from fine-screened salt and formulated with sulfur. Sulfur is an essential element in body cells and in the amino acids cystine, cysteine and methionine. 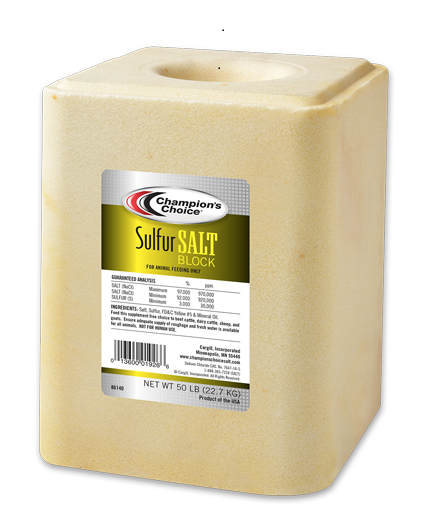 This sulfur salt lick or block is intended for beef cattle, dairy cows, goats and sheep. This sulfur salt lick or block is especially recommended when feeding urea or other non-protein nitrogen compounds in ruminant diets. Feed this supplement free-choice to beef cattle, dairy cattle, sheep, and goats. Ensure that an adequate supply of roughage and fresh water is available for all animals. Salt, Sulfur, FD&C Yellow #5 & Mineral Oil.